The Archbishop of Gulu Archdiocese His Grace Dr. John Baptist Odama has urged politicians to act and promote politic of harmony so as to have peace. Addressing the media shortly after the first Holy Mass to usher the 14th Edition of the Provincial Prayer and Peace week being hosted by Lira Diocese at Lango College, the Archbishop stressed about the objective of the event that is to bring unity and reconciliation among the people. He said to have peace there is need for the politicians to refrain from playing politic of destruction but to embrace the politic that cultivates peace among the people. Drawing from the the theme of the event; Good Politics at the Service of Peace, as chosen by His Holiness Pope Francis, Archbishop Odama said politician should focus on building peace not only in their home localities but for all human race. 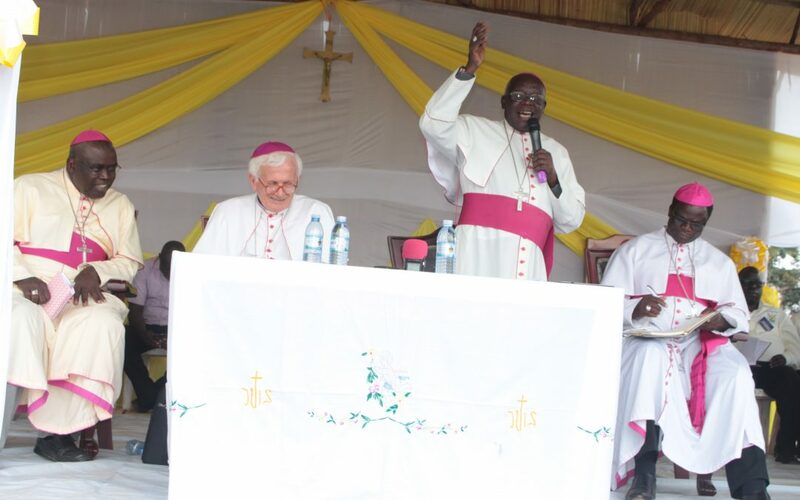 He said because of the annual Prayer and Peace Week that are held on rotational basis among the four Catholic Dioceses in the Ecclesiastical Province of Gulu, the community in Northern Uganda have started to embrace reconciliation and forgiveness among themselves. Initially, the annual event was meant to address the challenges and the adverse effects brought by the LRA insurgencies that lasted for two decades and other political upheavals that brought bad blood among the communities of the greater northern Uganda. It currently also addresses other social and economic issues that do not promote peace and development of the region and beyond the borders including the Republic of South Sudan whose pilgrims are among the thousands who have congregated at the Lango College Peace Ground.